CG- ½” to ¾” back from LE bot. wing. Elevon static setup 2 up elevon from bot. wing plain. Elevons throws ¼” up and down. New pixs and updated dwgs posted below. Wow! Nice work!! Got pictures? Sorry not good at that, I'll leave to others. There is a pix on the Mad Scratch Builder under Xbipe not very good though. Wish I could offer video of its flight. All the flier at the field who flew it were quite suprized at how it tracked and performed. I like your signature. I have been working on improving its design. First I have enlarges the elevons on both wings and as the top being static I have them set to match its bottom wing plain by hinge cutting and gluing them in place. I moved the wing forward a bit to so the elevons to be in line with the tail. I have also added wheels with associated gear and removed the wing skids. I hated that scratchy sound on take off and landing. I think I am going to change its name to Scooter Bipe as it very closely related to the Scooter plank. If you fly one you will know why the name Scooter fits. The first flight test on these changes were encouraging and I am moving to finish. Work in progress. I will have new drawings out but need to confirm them in build. If these changes prove not to improve its performance then what I have posted previously is yours to do as you desire and I hope you can find some ideas for your own designs. The only real problem that I have experienced is keeping its orientation in flight. These are the new updated dwgs. Flew this today and very pleased with its flight, smooth and clean. A bit windy here, around 10 mph plus. I had hoped that setting the top wing elevons to the plain of the wing bottom it would eliminate the up trim needed in the bottom wing. You still need a couple of degrees up added there. Note: 5/10/2018 - Corrected dwg error in Fuselage top fin. 5/11/2018 - Corrected small dwg errors in Elevons dim. I have redrawn the plans to be more consistent with Sponz FT drawing standards and attached them. 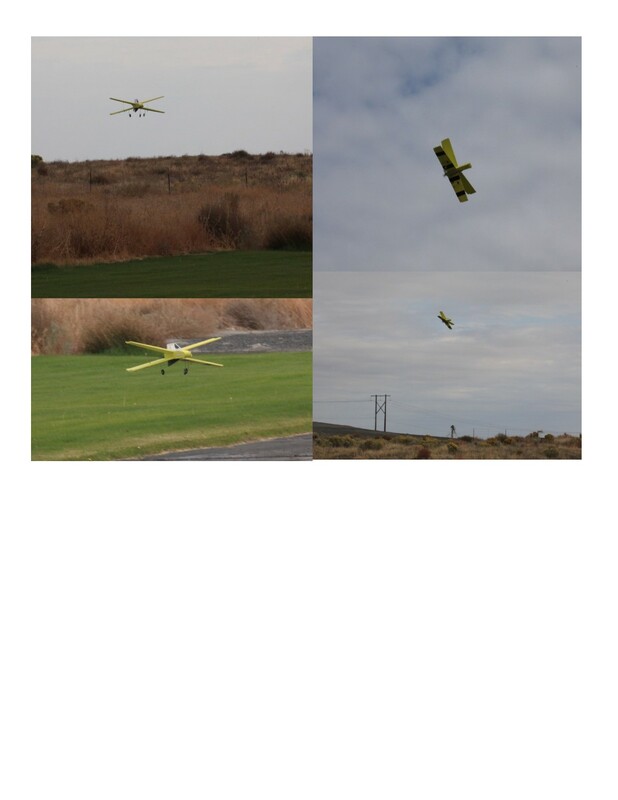 I attempted to get video of its flight, but none of our club member are into this activity. I have acquired some pictures attesting to its ability to fly. It has some very interesting flight characteristics as the CG is on or very close to its leading edge. It requires speed to break free of the runway and jump into the air (full up elevon). So, the name Scooter fits or I prefer the name Scoter which is a duck, when landing it looks like a duck. In this case a weird double wing duck. I am still working on setup, reflex and CG for best flight. I am thinking wingtip spoilers would help. I have increased size and couple the top and bottom wing elevons together and very pleased with change. When the CG was set to far aft its nose went vertical, thinking I must land it’s going to be a challenge, no, with throttle cut it settled like a duck landing. After making needed adjustments to elevon trim and CG it became a joy to fly. Thinking about extending the fuselage 1/2 1" maybe. Could have fun with it profile also and decoration. If you have any ideas as I am not an avionics engineer send them on or take the design idea and develop it further. You are very welcome to it. 10/12/2018: The CG is located at 1/4" to 1/2" forward of the Leading Edge. The reflex static setting for the elevons is flush with the bottom plane of the wings, you can add a couple degrees to this setting if you wish. That's effectively a flying wing. They normally need some reflex in the trailing edge to fly properly. The easiest way to get that is to have the neutral position of all the elevons up slightly. Is that how it is now? 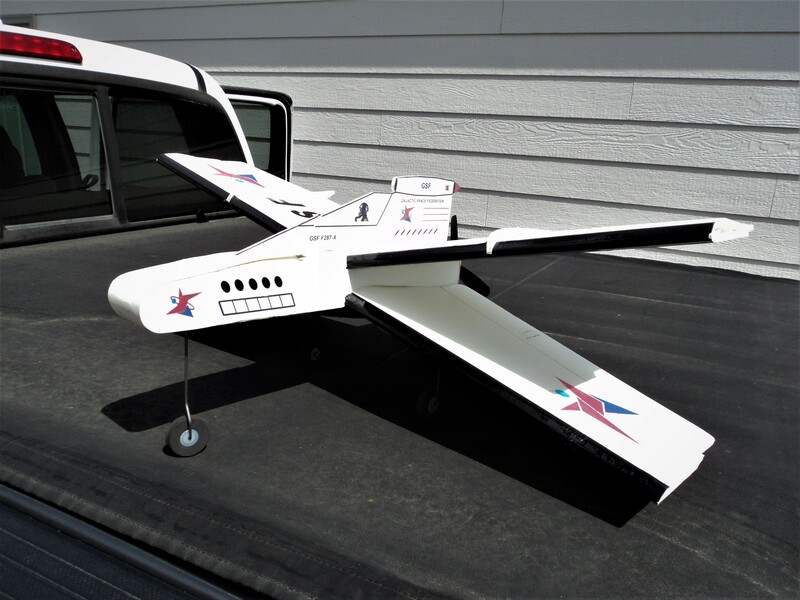 Out flying the X-Wing Bipe this the weekend and found the CG is farther forward than I thought as it is at LE and possibly a bit forward, had to add weight in the nose. Once it was settled down it flew great. If you like to spot land this is the one that can do it. On the bitter side Saturday the wind was up and it blew over my head. Wind does not seem to be a flying problem and in this case stupid mistakes leads to building a new one, pilot error. I know of no other plane that takes off and lands like this one, Tried to roll it and it prefers to barrel roll (Working on this). 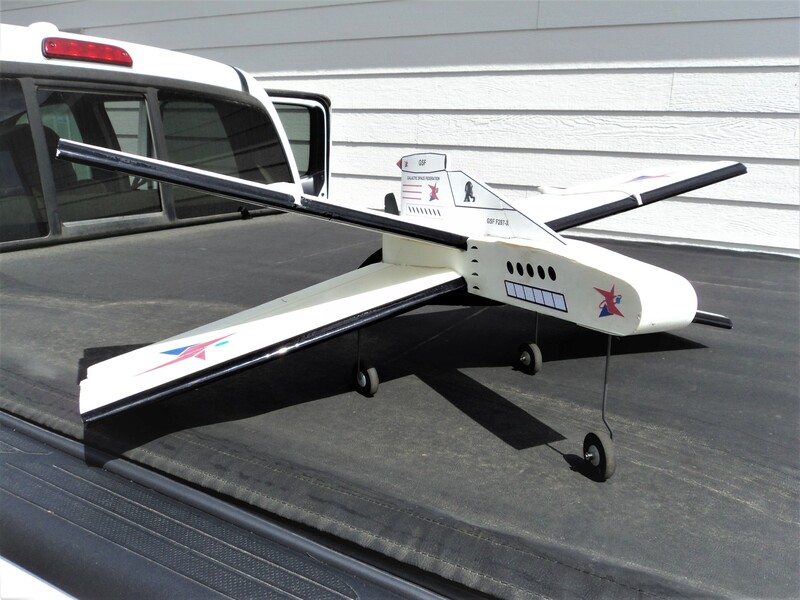 It has flat bottom wings and has the tendency to lose altitude in turns and in decreased speed change. I really need some help here on these issues as I am not the best flyer in the chicken coup. This is a new version of the X-Wing Bipe. 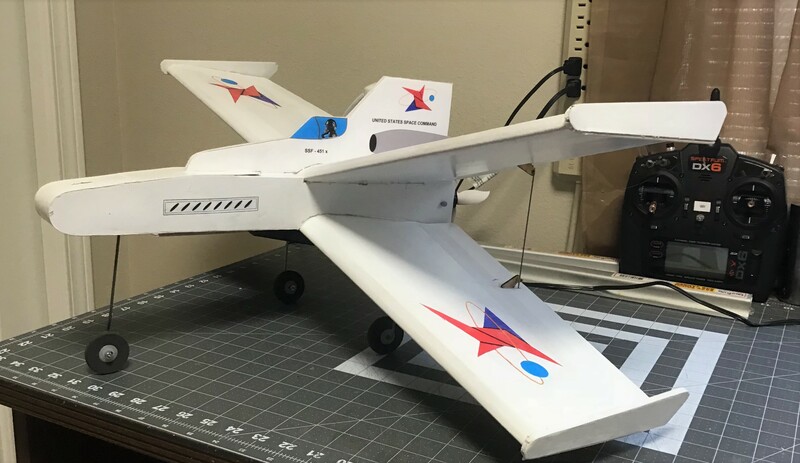 The nose has been extended 1/2" and have increased wing separation to improve fuselage strength, increase equipment space, and hopefully reduce interaction between wings in flight. New updated plans be on my first post after more flight tests. Our weather is changing to cold, wet and with snow on the way, so it could be awhile. A new version of the "X-Wing Bipe has been attached to earlier post. Changes made: Increase wing spacing to provide more room for flight gear and reduce interaction between the wings. Changed the fin/cockpit profile. Added 1/2" to the nose also to make more room for flight equipment.